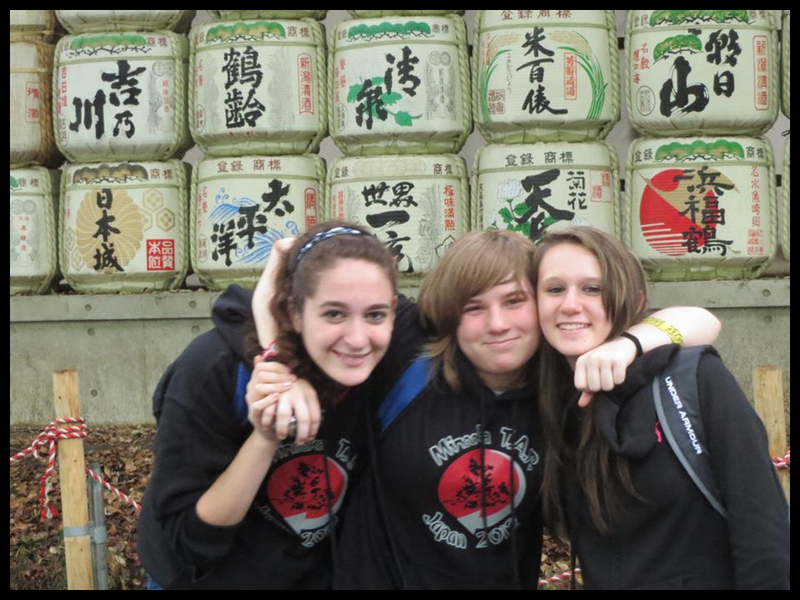 Minooka girls in a Shinto shrine in Tokyo. In 2012, TAP took their first trip that wasn’t based in Europe. There’s a whole great big world do see, so we decided to step a little further outside of our comfort zone and head to Japan. WOW!!! Boy did we get outside that comfort zone. Most of our dinners had a face, we couldn’t read a single sign anywhere, and there were bugs for sale in the candy section of the store. But, in many ways Japan was a perfect way to step outside of that travel box – people were amazingly friendly, the food was absolutely delicious everywhere we went (it looked weird, but it was awesome), and there was so much pride in each city, each temple, each castle, that you fell in love with everyplace you went. Mr. Curtis, Miss Lara, Mr. Doerr, and Miss Filetti welcomed Ms. Tadey to the group (Mrs. Harig was busy with her beautiful baby girl), and we did everything we could to prepare ourselves and the students for The Land of the Rising Sun. Our Japanese tour director, Kozuyo, who liked to be called Miss K, was the warmest, friendliest, most helpful person ever, and she began helping us with our teaching long before we met her in person. Our adventure began in Tokyo, one of the largest and busiest cities our group’s ever been to. The first day we started out by visiting the Meiji Shinto Shrine, where we learned the basics of the Shinto religion and prayer. Right away we felt the calm and peace in their shrine, an experience we began to crave every time things got crazy on the tour. For lunch we made our way over ton one of Tokyo’s shopping districts where we found the opposite of calm and peace – The Harajuku district was loud, crowded, and very close to sensory overload, but once you got your bearings it was fun. We realized very quickly that this trips wasn’t going to be as much about famous sites as it would be about personal experiences, and most of those personal experience came through food. So the first lunch we had in Japan was on Takashita Street (yes, I know), chowing down on Japanese crepes and finding weird things to drink in the abundant vending machines. Afterward, we visited the Asakusa Kannon Temple, which was surrounded by a park filled with vendors and performers of all sorts. That night’s dinner was another amazing food experience – tempura. Hand-battered and fried fish, shrimp, potatoes, eggplant, broccoli, and all sorts of goodies. Before the trip we were a bit afraid of Japanese food, but that first day set those fears aside for the time being. Minooka boys enjoying their first taste of a strange Japanese drink – it was delicious, by the way. Tokyo was our base of operations for a few days, but we took quite a few side trips out into smaller areas. Before we left town that first morning, we wandered a few blocks from our hotel and got to watch sumo wrestlers practice for a while. There were windows out on the street for you to watch the guys try out their moves. That was a really cool surprise, but off we went to Nikko. In Nikko we visited another shrine, so we got to practice washing our hands and mouths the way the Shinto folks taught us at the last one. Nikko is called the Spiritual Heart of Japan, so the complex of temples and shrines were incredible, taking us most of the day to explore. The next day took us to Kamakura and the second largest statue of Buddah in the country (we saw the biggest later on). Kamakura was a beautiful town, cherry blossoms lined the walkway that went down the main street in town, leading right up to the Buddah. We were allowed to actually go inside the statue, which gave us an opportunity to rub the Buddah’s belly from inside – which has got to be even more good luck. Aside from the Buddah itself, there’s not much to see in town – instead it’s about experiencing the people, the culture, and, most importantly, the food. Kamakura is known for two sweet treats that we knew we wanted to try, but finding them turned out to be quite an adventure. In the end, though, we did find the purple sweet potato soft serve ice cream – which was awesome – and the famous Kamakura pigeon/duck/partridge/dove cookies. We never did figure out which bird those cookies were meant to represent, but we felt like we were on The Amazing Race with all five teacher groups dashing through the streets of the town trying to be the first one to find the cookies. Every once in a while our hotel becomes, instead of merely a place to rest, a part of the adventure. That was the case in Hakone, where we stayed in a traditional Japanese Ryokan. Thin walls, special rolled out beds on the floor, pillows full of sticks, robes and slippers, and (if you chose) traditional Japanese baths were all in store for us, as was an elaborate meal that we ate with our chopsticks at low, low tables while sitting on pillows on the floor. This was definitely the Japan you see in movies, and we were living it. The food looked so weird, and many of us were scared to start eating, but once you did, everything was amazing. That night in that hotel is one of the best experiences TAP’s ever had. 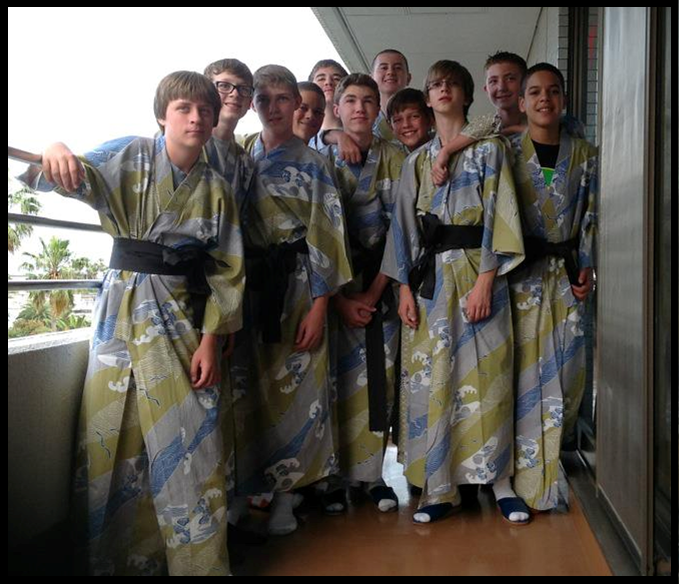 Minooka boys in traditional robes at the ryokan. The next morning we drove up Mt. Komagatake, a live volcano, where we grabbed lunch from a bunch of vendors cooking up soups, fish, and noodles alongside a beautiful waterfall. Most of our group opted for “fish on a stick,” a skewered whole fish covered with salt and seasoning, cooked on an open fire. It was delicious. We took a boat ride across Lake Ashi, where, if it had been a clear day, we’d have been able to see Mt. Fuji – but clouds thwarted us and a view of Fuji will have to wait til the next time we’re in Japan. On the other side of the lake, we hiked up a path through the woods. Surrounded by sulfuric hot springs, we began to hear the story of the black eggs. Most of us tried one, then rode a cable car down through the clouds to where our bus waited below. The next day took us to the former capital of Japan, Kyoto. There we got to explore Nijo Castle, with probably the coolest defense system we’ve ever seen, and Kinkaku-ji – the Golden Pavillion. Both were incredible sights to see. You can read more about our day at Nijo Castle here. We found ourselves in Nara, another former capital, that afternoon for one of the oddest animal encounters we’ve ever had in TAP. We’ve ridden donkeys and camels, we’ve met apes, we’ve seen peacocks and goofy looking red squirrels, but the deer park was one of the best. In Nara, we visited the Todai-ji Temple, which is the largest wooden structure in the world, and home to the biggest Buddah statue in Japan. The grounds surrounding the temple are the home to hundreds and hundreds of deer. The deer are protected there, because they’re thought to be the messengers of the gods, so they have no fear of humans. Some wily entrepreneurs have taken advantage of that fact and set up stands selling “deer cookies” for visitors to feed the animals. Whether you have a deer cookie or not, the deer assume you do, so everyone entering the park is immediately swarmed by deer. At first it’s fun and hilarious, but pretty soon you’re making a mad dash for the entrance to the temple. Inside, you get to see the giant Buddah. It makes the one in Kamakura look like a very spiritual midget. 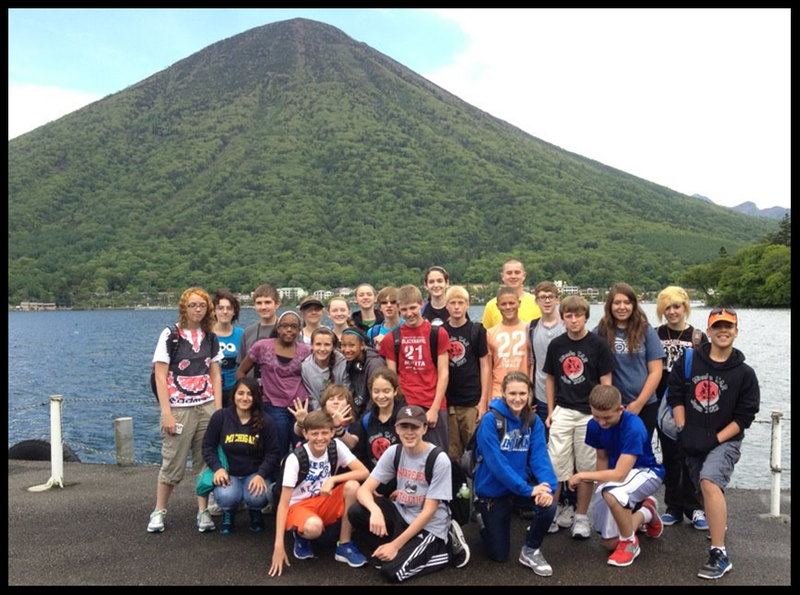 The whole group enjoyed a day alongside the volcano. Himeji was next. We went there just to look at Himeji Castle, also known as the Castle of the White Heron. It’s probably the most incredible building I’ve ever seen, but our timing was bad. The castle was in the middle of a three year renovation project, so you couldn’t see much through all the scaffolding on the outside, and the inside wasn’t fully accessible. We got kind of lucky, though. Even though we didn’t get to see the castle in quite the way we wanted, the Himeji people built a huge temporary building alongside the castle. From that building you can climb up and up and up, getting close up views of the roofs, windows, gutters, and turrets of the castle that no one else will get to see in quite that way. We were upset about missing Himeji, but knowing that we’d visit a few other Japanese castles later, seeing Himeji in such a unique way made it an awesome experience. That afternoon, we reached Hiroshima. Like our visits to Dachau and Pompeii, Hiroshima was a sobering and haunting afternoon. We started in the Peace Park, with a line of school kids ringing a huge dull sounding bell as a cry for peace around the world. From there we could see the A-Bomb Dome, one of the few buildings to “survive” the atomic blast that leveled the rest of the city. A walk through the park led us to a museum that showed the history of the town, the atomic detonation, and the days and years after the blast. It was not an easy museum to walk through, and it raised many, many questions in our minds, but all of us felt it was an important part of our Japanese experience. Miyajima Island is another enormous shrine. There were more “wild” deer, but while these guys were looking for snacks, they weren’t nearly as aggressive as their cousins in Nara. It took a peaceful boat ride through the floating Torii gate to reach the island, and it was a calm peaceful walk around – a zen sort of day that we needed after the emotion of Hiroshima. We headed further south that afternoon, stopping in Iwakuni to see the incredible Sash Brocade Bridge that has to be seen to even gather how beautiful it is, then we rode a cable car up the mountain to Iwakuni Castle. The inside of the castle had been turned into a museum full of historical artifacts, and the top floor was a great place to view the city below, but it was also a really cool chance for us to get another look at what we learned about Japanese castle defense and construction at Himeji. When we went back down to town, we found an ice cream shop with 100 flavors of soft-serve, and the kids lined up to see who could order the weirdest flavors. The winners were garlic, habenero, and charcoal. 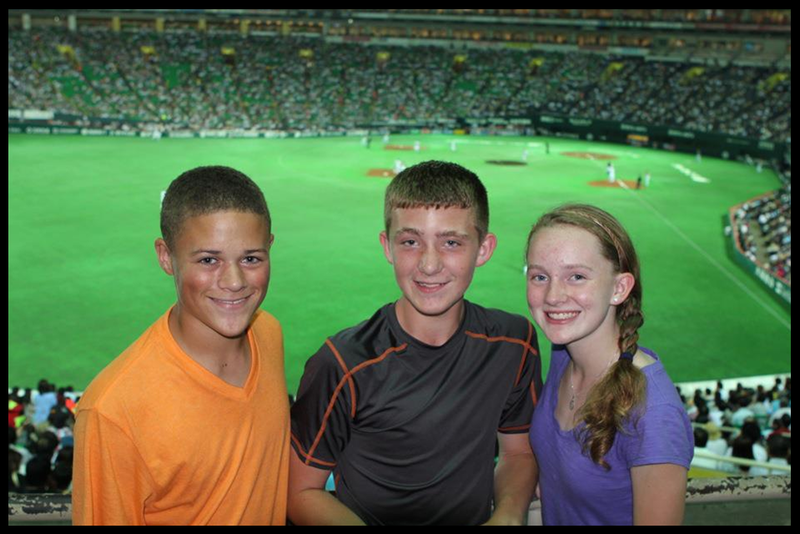 One of the greatest days in TAP history continued late into the evening when we headed into Fukuoka to see the Fukuoka SoftBank Hawks baseball game. Without a doubt, the ball game was one of the single best experiences we’ve had in TAP, and at the same time one of the craziest. Baseball is the all-American sport, there’s not much that screams USA more than going to a ballgame, but while the product on the field was totally familiar, all that went on around it was entirely new. Read more about our time at the Hawks game here. The end of our trip was nearing, so we jumped on the Bullet Train, and at 200 miles per hour, we were in the middle of the country in Osaka in no time. Most of our time in Osaka was spent relaxing, walking around the city and enjoying every last bit of Japanese culture. We were able to tour Osaka Castle, which mirrored what we saw in Himeji, only this time we got to go inside and see the other side of castle life. 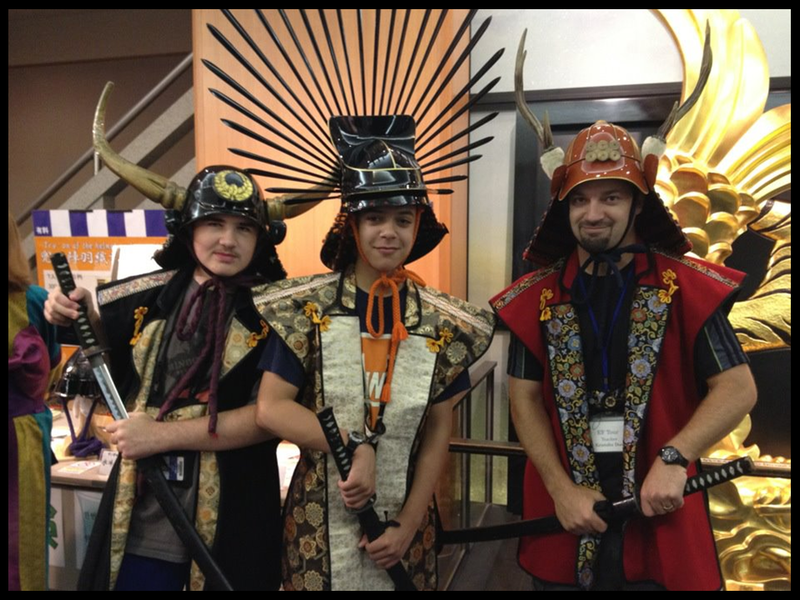 We even got to dress up as samurai and geisha in the castle museum. On our last night we had the chance to really get into the culture, seeing a special kind of Japanese puppet theatre called Bunraku. That was an incredible way to end our trip to Japan. Saumrai Doerr and his ronin friends. So many of the previous TAP adventures were about what we saw and trying to see as many amazing places as possible. This was a whole new ballgame for us. Japan wasn’t about cramming more and more and more in to each day, it was about soaking up each experience. It was about conversations with new people. It was about understanding the past. It was about seeing the similarities in our two cultures and getting excited about the differences. It was about food – lots of food – lots of incredibly weird looking, sort of scary, but ultimately delicious food. That kind of sums up Japan – in so many ways we felt like we were stepping far outside of our comfort zones, but what we were really doing was expanding them. For that, we owe Japan many thanks.